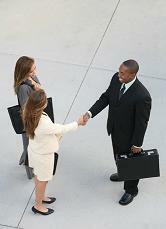 Sooner or later you will be asked to present an icebreaker introductory speech about yourself. It may be at school, at church, in the workplace or at a team building conference. We all know a great deal about ourselves! So sell yourself and create a positive and memorable impression. Follow the icebreaker guidelines below to help you structure your introductory speech. The stage is all yours - insight into you ...for a positive impact and impression! Remember, you only have a few minutes, so you cannot tell your audience everything about yourself. So, choose 3 or 4 main areas of your life and elaborate with a few key ideas on each of them. Keep a key card and pen handy. Jot down the 3 or 4 main categories in a mind map as sub-headings. Flesh out the sub-headings with bulleted keywords [4-5] under each main point. Find a quote that is significant and meaningful to your life. Memorize it and conclude your icebreaker speech with a powerful, relevant quote that leaves the audience with insight into YOU! Self introduction is also your key to interview success because you are starting from a baseline position where they have no experience of who you are or what you are like. Be prepared to introduce yourself - it will allay your fears and you'll present a great introductory speech! Thoughtful, structured and logical - you can't go wrong!